In recent years, we have seen more and more people adopting a healthier and fitter lifestyle. Moreover, as this fitness revolution is taking over, many individuals are trying to sculpt and transform their bodies into better versions. In this scenario, questions about the best type of diet, as well as exercise routines and regimes are common. For anyone who has tried unsuccessfully to lose the poundage around their belly, the search for a practical solution is always on. People of all ages are searching for excellent ways to reduce stress levels. The single-step solution to these modern-day problems, however, may be hiding in the ancient Indian practice of Yoga. Yoga refers to ancient Indian practice that combines physical poses (asanas), meditation, breathing exercises, techniques, and other stretches. In modern times, this practice has become popular across the globe for its many benefits. Regularly practicing yoga is known to help with restful sleep, correcting appetite, improving flexibility, reducing stress levels, promoting a good mood, and even losing weight. Additionally, it is believed that regularly practicing the poses and breathing techniques can aid in controlling the mind and body. There is more than one type of yoga, and each branch has a unique set of rules and principles. Some of the most popular kinds of yoga include Hatha yoga, Bikram yoga, Iyengar yoga and Power yoga. Power yoga studios are a staple in many countries across the world for their contribution to any weight loss or fitness and wellness regime. The benefits of regularly practicing yoga include a balanced metabolism, increased body flexibility, improved sleep, elevated moods and even prevention from injuries. Right from athletes and professionals, to young people and seniors, yoga has benefits to offer to all its practitioners. When it comes to burning belly fat, some yoga poses effectively work on whittling down your waistline to make it slimmer. When combined with a balanced and healthy diet, as well as a healthy exercise and workout routine, it can help blast away abdominal fat. Apart from helping you reach your weight loss and toning goals, yoga poses to burn belly fat will also help you in other areas such as relaxation, improved digestive health, and stress reduction. Now that you know how effective yoga can be to your weight loss endeavors, let’s understand which poses will help you the most. We’ve compiled a list of the 10 best poses for burning belly fat. As is the case with most types of physical exercise, warming up is required even before you jump into a yoga routine. In this case, the mountain pose is highly effective. 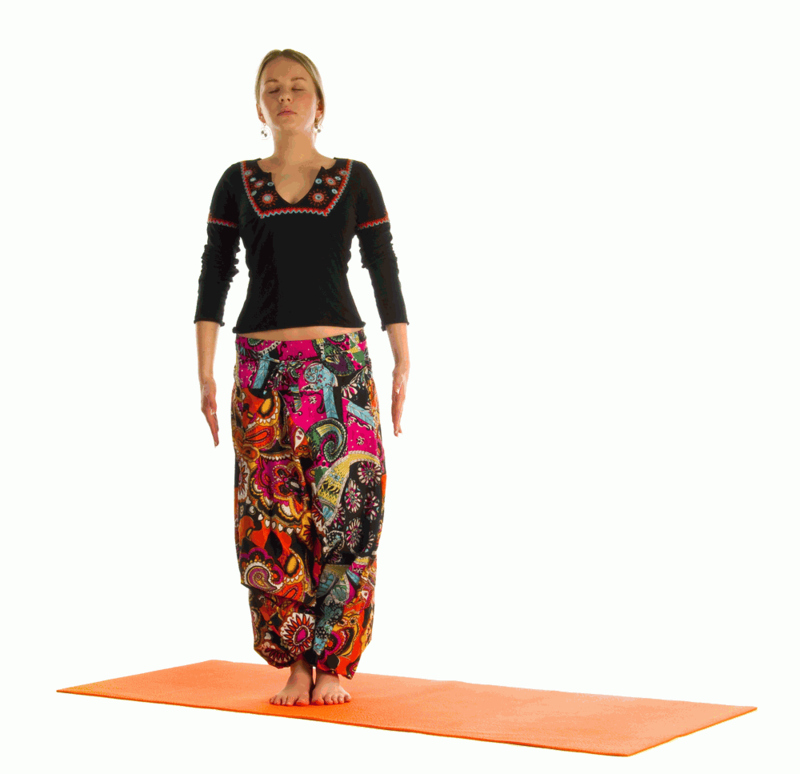 Tadasana helps by boosting the body’s blood circulation, making sure that it is prepared for a routine. Stand up erect, and with your legs placed slightly apart, and your hands placed along either side your body. Tighten your thigh muscles in this position. Lift up your kneecaps gently, without applying any pressure to your lower abdomen. As you lift the inner ankle, tighten the arches of your feet. As you do these steps, imagine a healing white light or energy passing through your feet, up to your ankles, then to your calves, thighs, groins, all the way up your spine, finally to your neck and then your head. Now, gently turn your upper thighs inwards, gently elongating your tailbone, and lifting up the pubis to bring it closer to your navel. Look upward gently upon completion. Maintain this position and gently breathe n, stretching your shoulders, arms and finally chest in an upward direction. Simultaneously raise your heel, balancing your body’s weight on the toes. Feel every small shift during this stretching phase, and then hold. Finally, exhale and release from this position. The duration of this entire movement should last between 15 to 25 seconds. If you suffer from vertigo, insomnia, migraines, constant headaches or low blood pressure, it is best to avoid this asana. Additionally, although this is a pretty straightforward position, beginners may experience difficulty balancing themselves during the initial attempts. To improve balance, it is best to maintain a gap of around three to five inches between your inner feet until you get accustomed to the pose. With regular practice of Tadasana, you will see that your lower abdomen and buttock region will get more toned. Additionally, your posture will improve, and any sciatica-related pain is elevated. You will also see that your knees, ankles and thighs are strengthened after a few weeks or regular practice. The bow pose is another simple, yet effective pose when it comes to blasting away your unnecessary abdominal fat. Additionally, it is considered to be one of the twelve most important basic Hatha yoga poses. Since this pose stretches out the back effectively, it is beneficial for flexibility and strengthening the back. Start by lying down on your stomach, with your hands resting on either side of your body with palms facing downwards. Keep your feet slightly away, with almost a hip-wide distance between your feet. Then, slowly bend your knees at a gentle pace and hold your ankles. Once you are in this position, inhale deeply and pulling on your ankles, lift your chest as well as your legs from the ground, mimicking the shape of a bow. Once you are in this position, look straight ahead and relax your facial muscles. Hold this pose firmly, and as you concentrate on your breath, keep your body taut. Once you find your comfort within this pose, take longer and deeper breaths. Exhale and release after about 15-20 seconds in this pose. Apart from the fact that the bow pose stretches out your abdomen muscles, it is also useful in strengthening your back inside and out. By stimulating the neck and abdomen, it offers long term benefits and improves your posture. Many yoga experts believe that this pose can also boost the reproductive organs and the digestive system. While this pose has a lot to offer those who want to lose belly fat, it should be done with caution. Any mistakes in your technique may lead to unwanted problems. Moreover, people with injuries in the lower back or neck area shouldn’t practice dhanurasana. Pregnant women, menstruating women, those with high blood pressure, or hernias should avoid this pose. If you’re really serious about cutting down belly fat, try the yoga burn program. The ‘Hand Under the Foot Pose’ is a sharp forward bending pose. This pose belongs to the family of inverted yoga asanas and has a host of amazing benefits to offer the body. To start with, stand in the same position as Tadasana. This means that your hands must be on either side of your body, the feet must be resting together, and the heels must touch each other. Ensure that the spine remains fully erect. Once you are in this position, inhale deeply, and then lift your hands in the upwards direction. When you exhale, bend forward so that your body is parallel to the ground below you. Continue inhaling and exhaling, and lean forward completely, pushing your torso away from your hips. In this position, try to touch the floor. Ensure that your knees aren’t bent. If you are a beginner and find it difficult to do this, aim for your toes or ankles. Eventually, you can work your way lower to the floor. In this bending position, keep your tummy tucked, while holding your breath. Remain in the same position for 60 to 75 seconds. Upon completion, exhale, release your fingers and return to the Tadasana pose. Before you get into this pose, ensure that you are accustomed to forward-bending stretches. Regularly practicing this asana helps strengthen the thighs, knees, calves, and lower back. Since your abdomen will compress fully as you bend forward, the muscles in that area are activated. This is how you lose belly fat with Padahastasana. Additionally, this pose is known to relieve your physical and mental exhaustion. Regular practitioners notice an improvement in digestion and toned abdominal muscles. The seated forward bend pose is one of the basics in Hatha Yoga. This pose stimulates the solar plexus and also tones your tummy. The combination of its effects makes it ideal for burning belly fat. To begin, sit in Sukhasana with your spine full erect. Stretch your legs out in front of you. Make sure that your feet are pointing towards the ceiling. Inhale deeply and stretch your hands above your head while making sure not to bend your elbows. Follow your hands with your gaze steadily and stretch your spine out to its maximum capacity. When you exhale, bend ahead from your thighs, bringing down your hands. When you bring down your hands, try to touch your toes. If you’re a beginner, aim for your ankles. After you reach your toes (or ankles), hold them and pull backwards till you feel your hamstrings stretch. Once you are in this position, breathe in and hold your abdomen. Retain this pose for 60 to 90 seconds. Afterwards, exhale gently and bring your body back to the starting position. The Seated Forward Bend Pose is known for relieving stress and calming you down. Additionally, it has been linked to burning away of belly fat and toning of the muscles in that region. In case of women with irregular or painful menstrual cycles, this asana can help tremendously. However, people with spinal disc issues or those who have recently undergone abdominal surgery should not practice this pose. The Wind Relieving pose is extremely useful in relieving the discomfort associated with gastric problems like constipation and indigestion. Moreover, since this pose requires you to put pressure on your tummy, it helps triggering fat burn in your abdominal area. Start by lying down facing upwards (in the supine position). Keep your arms at either side of your body and keep your feet stretched out, with your heel touching one another. Now, bend your knees and exhale. As you do this, slowly bring your folded knees to your chest and with your thighs, apply pressure to your abdomen region. To keep your knees locked in this position, clasp your hands under your legs. Hold your body in the same place for anywhere between 60 to 90 seconds. Make sure you breathe deeply in this state. Once you are done, exhale slowly and release your knees. Slowly allow your head to return to the floor. Bring your hands on either side of your body, back to the starting position. You can repeat this pose anywhere between seven to ten times, leaving 15-second intervals between each repetition. Admittedly, compared to many simple yoga poses, this asana may be daunting for first-timers. In this scenario, you can begin by using a single leg to perform this asana. The wind relieving pose helps reduce your abdominal fat by stimulating the muscles in that region. Additionally, your abdominal and back muscles are also strengthened. With regular practise, you will notice the muscles in your legs and arms getting more well-defined and toned. In case you have any serious spinal issues or blood pressure problems, it is not advisable to do this asana. Additionally, if you are on any heart medication or have a history of heart illness, refrain from performing this pose. The Boat Pose is undoubtedly one of the most well-known poses when it comes to achieving a flatter belly and toned abdominal muscles. By working on your deep hip muscles, it also helps strengthen the core in a way that fortifies your body’s structure. What crunches and leg lifts are to Pilates; the Boat pose is to Yoga. Lie on the floor in the supine position with your legs stretched out, and your toes stretched out towards the ceiling. Keep your arms on either side of your body, with the palms resting towards the body. Now, inhale deeply. As you begin to exhale, slowly lift your body from the ground. Start by raising the head, followed by the chest, and then your legs. Stretch your arms out so that together they form a parallel line with your legs. Keep your fingers on the same level as your toes. As you continue in this position, you will feel the contracting of your abdominal muscles. Stay in this position for 30 to 60 seconds, breathing in and out regularly. Inhale and exhale gently, and then release your body from this position. Gently bring back your body to the starting position. Take a break of around 15 seconds and repeat. The main advantage of Naukasana is that it strengthens the abdominal muscles and aids in eliminating fat deposits from this area. Since the digestive system is also stimulated, it can help in improving the health of your digestive organs. With regular practice, people, notice that their shoulders, thighs, and arms are strengthened. The Came Pose is essentially an antithesis of Naukasana. In this asana, you stretch in a backwards direction, and the resultant abdominal stretch is effective in toning your muscles. Any tension that gets built up in your body during Naukasana gets released with this pose. To begin the Camel Pose, start by sitting in Vajrasana. Now, slowly lift up your body from the knees. It should be so that you are sitting with your body’s weight balanced on your knees. Your heel should fall perpendicularly to the ground. Once you are in this position, deeply exhale and then arch your back. Gently try to reach out and hold your ankles, one at a time. Now tilt your head back, stretching backwards till you feel a gentle pull in your belly. Hold this position for 20 to 40 seconds while breathing normally. Afterwards, exhale slowly and gently return to your starting position. Relax for 15 to 30 seconds before each repetition. You can repeat this pose 10 to 15 times. Regularly practising the Ushtrasana is known to aid in posture improvement as well as strengthening of back muscles. This pose can relieve any menstrual discomfort or mild cases of back pain and fatigue. Additionally, it can also aid in blasting away belly fat. People who suffer from heart ailments, neck pain or have any injuries in these regions should avoid this pose. Similarly, people with high blood pressure, migraine, or insomnia issues should refrain from performing the Camel Pose. The ancient practice of Yoga has helped millions of people across the globe to strengthen their bodies and get in touch with their best self. It has been linked to a happier, more positive and vibrant mindset and regularly practising Yoga has a host of benefits for those trying to lose weight. The poses and asanas in this article can certainly help you burn away belly fat, even the most stubborn of abdominal poundage. However, it must be practised regularly and should be supplemented by a healthy diet and exercise regime.